This delicious one pot meal recipes post has been brought to you by Foodie.com. All opinions are 100% my own and may differ from yours. I will only endorse companies, products and services that I believe, based on my own experiences, are worthy of endorsement. They’re really is something comforting about crock pot/slow cooker and/or one pot meals. Especially in the fall and winter. Since we seem to have skipped fall and gone straight to winter here, I’m looking for some hearty, tasty, yet, easy, one pot meals. Less clean up, especially if I use my slow cooker and use a crock pot liner, less time consuming (just throw everything in the crock pot in the morning and it’s ready for dinner), and so hearty on a cold day. I was looking for some one pot meal recipes and found these asy, tasty, one pot comfort meals that are sure to satisfy the whole family. I’m making the chicken pot pie this weekend. Then I’ll try the and next week… another thing I love about one pot meals — the leftovers. It makes stretching the grocery budget further, not to mention that I find one pot meals taste better the next day. 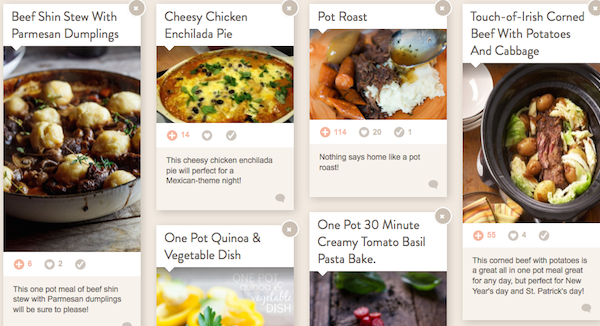 So click on the Foodie widget above and try some of the one pot meals yourself. My fave one pot meal is crock pot beef curry. Mmmm! I love crock pots. My favorite is corned beef and cabbage. One pot meals are always great, my favorite is the Cheesy Chicken Enchilada Pie. Thank you for sharing this post. Oh yum, that Cheesy Southwestern Chicken Soup looks so good. Think I will make that this weekend. Thanks! My family will be having a lot of these this holiday season. I just don’t have the time, great collection. I love to use my crock pot! My favorite is stew beef and potatoes and carrots. Nothing better then hearty one pot meals during the cold months. One of our favorites is a one pot meal called Chili Con Carne. Thanks for the post and the widget. Pot meals are great at this time of year, plus it’s a time saver for me personally as I’m a single mom and don’t get home from work until 6 pm usually, so something easy to make is essential. My teen can do these on her own and have it cooking , by the time I get home everything is ready and we can sit down and eat together. Will have to try these out, thanks! I love my crock pot. One pot meals just make my life easier. Thank you for sharing. I love easy one pot meals. I don’t cook often. When I do, you can bet it’s going to take minimal effort. I love cooking in the crock pot! It makes things so easy! I make chili or dried beans a lot in my crock pot but am excited to try the cheesy chicken enchilada pie. It looks fantastic! The creamy tomato pasta bake sounds incredible. I’m so putting that on our menu plan for next week! Post roast or stew or chili are my favorites. That’s one great collection of crock pot recipes. Thanks for sharing. I only make roast beef in mine. I really need to try other dishes. The chicken pot pie and taco soup look great. My favorite is a pot roast in the crock pot with potatoes and carrots. We are going to have to make one soon, as that sounds really good. First, I’d like to thank you for featuring us! And, these all look very tasty and perfect for the colder weather. I want to try that crockpot taco soup! Man oh man, that sounds good! I actually fixed some taco soup earlier this month and it was quite delicious! That one pot quinoa & vegetable looks pretty good, too. Awesome recipes for a busy mom, for sure! Thanks for sharing. You had me at “one-pot”! A few years ago, I would of said the Cheesy Chicken Enchilada Pie, but now I am on such a restricted diet for my health I was delighted to find the One Pot Quinoa & Vegetable Dish. I love one pot meals. Thanks for sharing. Cheesy enchilada chicken pie sounds delicious! They all look so amazing, and after all the clean-up of Thanksgiving I’m excited about just one pot to wash! I also adore hot pot meals for cold days. I love Korean hot pots the most. Thank you for sharing these great meals. I will be giving some of them a try. I’m a huge fan of one pot meals. They taste great and are usually super friendly on the wallet. I saw the corned beef recipe and am now dying to try it. My favorite one pot meal has to be Cabbage hamburger soup (our family recipe) yum! Cannot wait to try some of these and only using one pot easy cleanup. I; am going to try the cheesy chicken enchilada pie. Looks easy to make and sounds delicious. I absolutely love comfort food and one pot meals are always preferred due to our busy schedule. I have been craving chicken pot pie for awhile now, so I may need to add that to our meal lineup soon. I like the chicken and stove top recipe. That and a thick. meaty spaghetti sauce. I love using the slow cooker. Put everything in, turn it on and forget about it. It leaves less mess to clean too. I adore pot roast with mashed potatoes. Sooooo good! These look amazing, I will have to check them all out. Thanks for sharing. Great idea! I love one pot meals! Easy clean up and I’m not running around the kitchen trying to find extra countertop space!